People jumped into action — and found her in the nick of time. 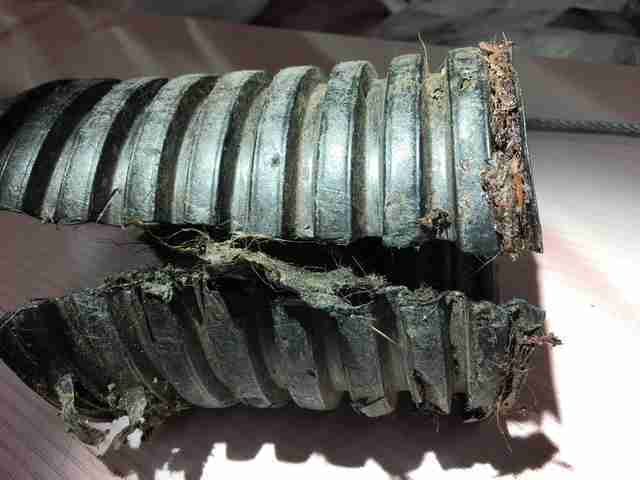 The wild coyote had gotten herself into trouble — she’d pushed her head into a construction tube made out of heavy plastic, and the tube had tightened around her neck. She couldn’t get out of it on her own. “I surmise that what happened was she was out hunting in a construction area, went after a rodent and got it stuck,” Matt Anderson, director of the Fund for Animals Wildlife Center, told The Dodo. 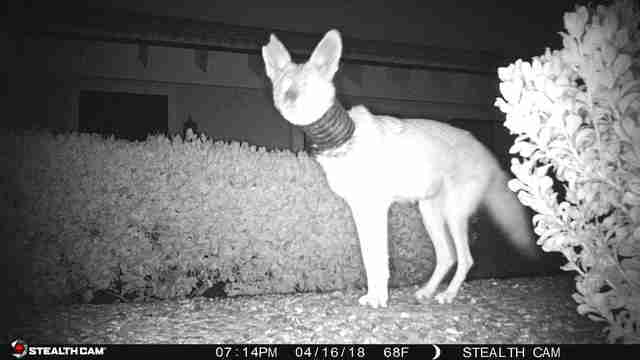 Luckily, the coyote stepped into a camera trap on a woman’s property in Rancho Bernardo, California, in April, and the woman, who’s a big animal lover, knew exactly what to do. 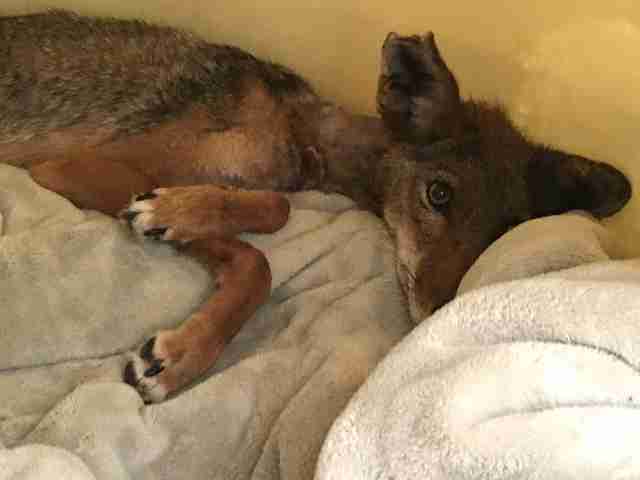 She contacted the California Department of Fish and Wildlife (CDFW), and asked if someone could rescue the coyote. However, the officers who examined the footage were hesitant to do anything at the time. It was the start of coyote breeding season, and if the coyote had pups nearby, the pups would starve if they took the mother away. So they waited. 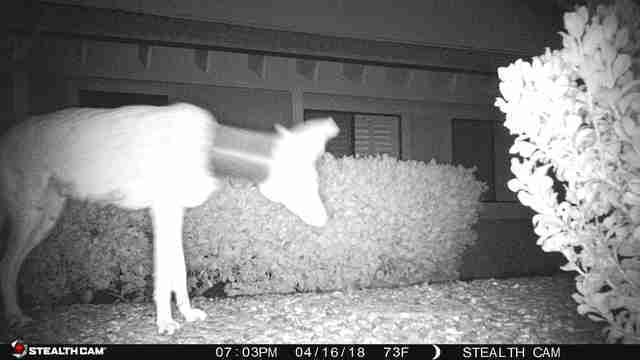 About a month later, the woman spotted the coyote again. 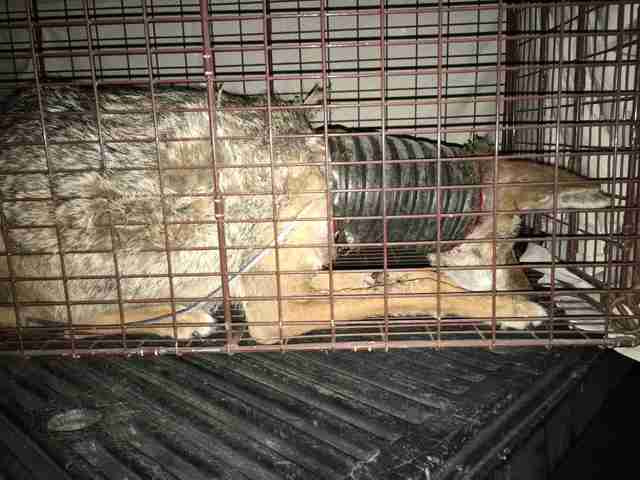 This time, she was in much worse shape — she still had the construction tube around her neck, she’d lost a significant amount of weight, and her neck was now clearly injured. The woman reached out to CDFW a second time, and they, in turn, contacted Fund for Animals Wildlife Center and asked for the group’s help. Rescuers immediately went to the woman’s property and set up traps to safely catch the injured coyote. 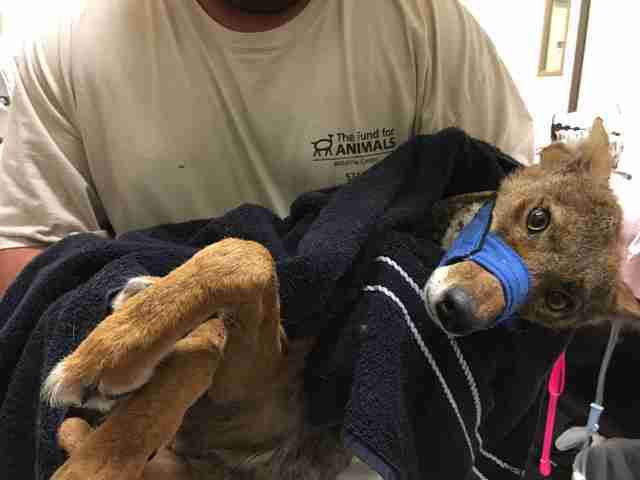 It took several weeks for the rescuers to catch the coyote, but as soon as they did, they moved her to the rescue center and removed the construction tube from around her neck. On the second night, the coyote showed great improvement — she ate everything that was offered to her, and she even started moving around. 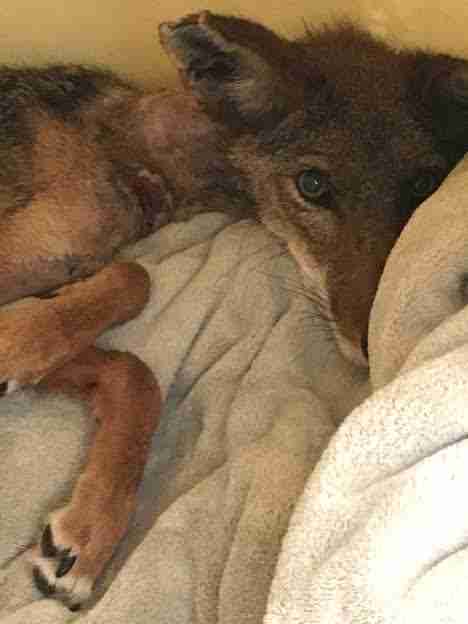 The coyote will need to spend several more weeks at the rescue center to allow her wounds to heal. If all goes well, she will be able to be released back into the wild as soon as possible, Anderson explained. If you see an injured wild animal, get in touch with a local wildlife rehabilitator or rescue center. You can also help the Fund for Animals Wildlife Center rescue more animals by making a donation.